Watch the Mag-Knight� Magnetic Tank Bra Installation video. All of our tank bras are custom cut and molded to an actual tank here at the factory. We achieve a 100% seal against the tank or it doesn't go out. We achieve this fit using HEAT AND PRESSURE simultaneously. In most cases, it is very easy to align the bra to your bike using the natural mold lines as a guide. Occasionally, it may be difficult to detect how high or low to install the tank bra for optimum fit. The goal is to duplicate the position on our mold to achieve a perfect 100% seal. To aid in installation, we have created this fitment chart. 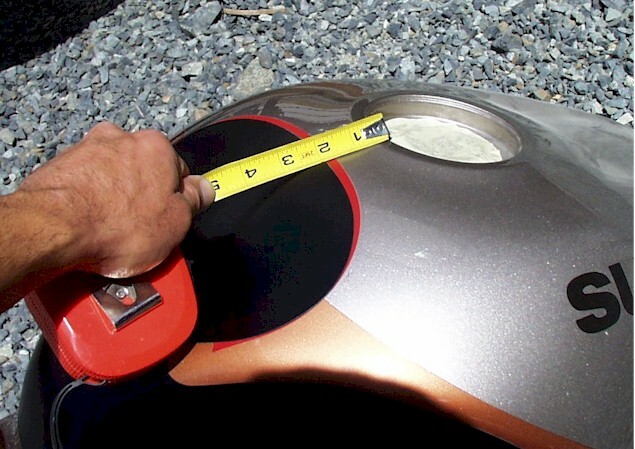 The dimensions shown are from the top edge of the bra to the filler cap cut out. Using this dimension you can align your bra for a perfect fit. The directions included with each bra will detail how to achieve that 100% perfect seal. Once the bra is installed and sealed, you will have a perfect fit forever without ever having to heat it again. The first fit usually takes about 5-10 minutes max. We recommend using the natural heat from the sun to install your tank bra. When that fails, we recommend using a standard hobby heat gun. Be sure that your gas tank filler cap is closed when using the heat gun. All tanks vent to the bottom of the bike so there should be no fumes around the cap. Just to be sure perform the heat gun operation in a well ventilated area. Watch the video form more information. Do not install our magnetic tank bra on motorcycles that have been painted in the last 3 months. The paint is still flashing and the air tight barrier created by the bra will adversely effect how the paint dries under the bra.